HOMEUncategorizedYour mama was right…you should eat your breakfast! Greetings FlipTowel Nation! We hope this blog finds you well. As you already know, the FlipTowel Team believes in living a healthy lifestyle and we are committed to blogging about relevant topics that will inspire you to do the same. Today’s topic? Eat your breakfast! Here are 3 healthy easy breakfast ideas. 1. SHAKE IT UP! 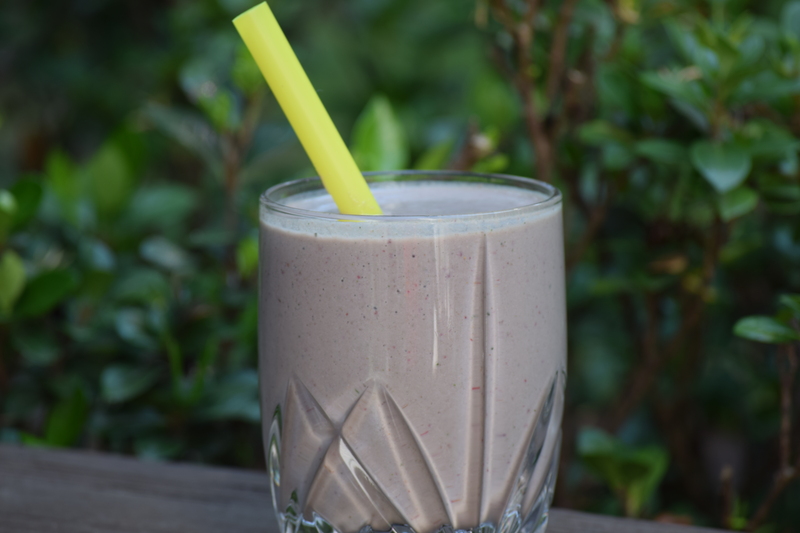 ~ With the wonderful invention of the Nutribullet, Ninja (Our favorite is Ninja) and other high powered shake machines, you can mix up a quick healthy shake in no time! Keep it simple & keep it low sugar…1/4 c. frozen blueberries, 1-2 fresh strawberries or 1/2 a banana, a few healthy fats like some nuts (we like walnuts or 1 Tsp of organic Almond butter), frozen spinach (a handful – you can buy a bag of fresh spinach at the grocery store and put it straight in the freezer to last for weeks), 2-3 Tablespoons of plain greek nonfat yogurt, and for the liquid, 1/4-1/2 Cup of water or unsweetened Vanilla Almond Milk. Mix all together. 2. OATMEAL! ~ We like whole oats as opposed to quick oats. 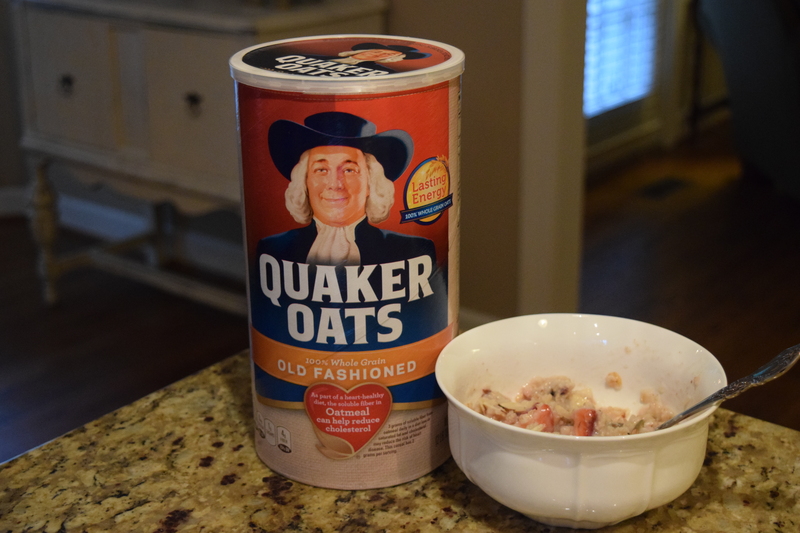 And if you want to make them fast, put 1/3 C. Oats in a large (at least 4 cup glass measuring cup) and 2/3 Cups water. Place in microwave for 1 minute 45 seconds approximately. Remove, add a little skim milk or unsweetened Vanilla Almond milk, add some healthy fats like almonds or walnuts, add some fruit like sliced bananas or strawberries, raspberries or blueberries. 3. EGGS! Eggs are full of protein and can provide quite a healthy breakfast. 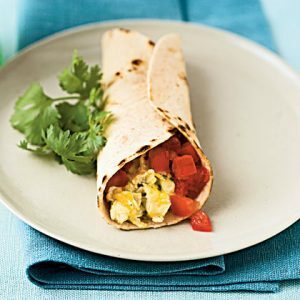 Our favorite twist on eggs….Make an egg burrito! Use a 100% whole wheat burrito. Make up some scrambled eggs, place in burrito, add a little low fat mozzarella cheese, some peppers or any veggie that you love & wrap it up. 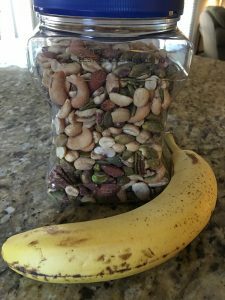 ON THE GO IDEA FOR BREAKFAST! ~ Keep a mixture of nuts in your pantry ~ pack a handful in a ziplock ~ grab a banana (READ HERE why bananas are awesome) and you’re off to work! This simple fast breakfast gives you all kinds of nutrients and will hold you until lunch. Thanks for reading FlipTowel Nation! No Comments to "Your mama was right…you should eat your breakfast!"